From adorable, three-eyed Martian costumes for toddlers to truly scary outfits for adults, there are lots of different styles of alien costumes to choose from. Whether you need an outfit for Halloween or want to impress at a costume party, you can purchase or create an awesome look. If you want a costume that's a little more unnerving than it is cute, go for a robed alien. Traditional little green or gray men take on a slightly sinister feel when their bodies are covered in long, dark robes. You can make or buy this costume, depending on your budget and time constraints. The best way to make your own robed alien is to start with a basic mask. The Green Alien Mask, which retails for about $30 from Halloween Express, is a good choice. There are also gray and flesh colored versions if you prefer those looks. You'll also need a good sewing pattern for a simple hooded cape or robe. McCall's M4139 is a great option that is easy to sew and works for both men and women. You can find it at most craft stores for around $10. Purchase the pattern and supplies required. Choose black or dark gray fabric. Using the pattern instructions, make the robe. For additional impact, sew metallic silver or lime green trim along the hem and front opening of the robe. Wear black clothing, black gloves, and the alien mask. Put on the robe to complete your look, making sure you pull the hood up over the top of your mask. 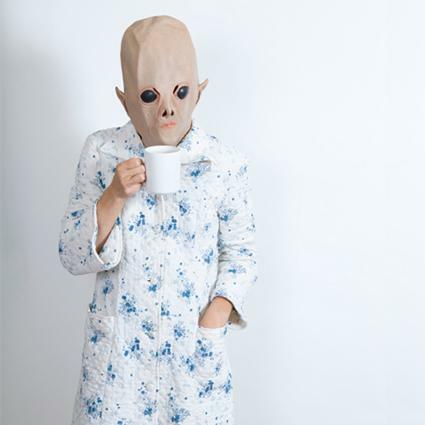 Your robed alien doesn't have to be creepy. In fact, this is a costume that lends itself to creativity. Instead of the traditional black or gray robe, opt for a bathrobe or housecoat. Amp up the funny factor with everyday morning-related props like a cup of coffee, a toothbrush, wig with hair curlers, or a frying pan and spatula. 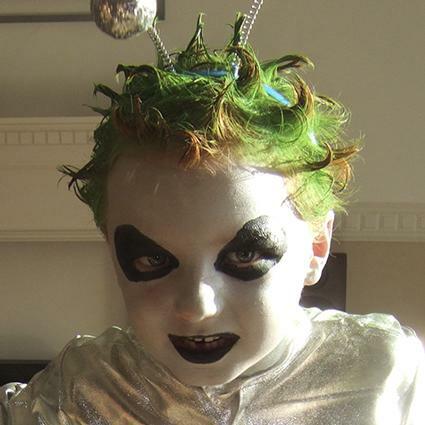 Complete Alien Child Costume - This affordable option from BuyCostumes.com includes a gray mask with shiny black eyes, a blue robe, and gloves. It comes in sizes small, medium, and large to fit kids up to size 14, and it retails for about $30. Alien Mask with Attached Robe - An adult-sized version of the robed alien, this costume includes a mask attached to a cape. It features a gem-studded collar and a creepy gray face. The outfit fits most adults and retails for about $40 from Halloween Express. Grand Alien Costume - This deluxe costume features and animatronic mask that moves in a realistic way. It also comes with a robe and character hands to complete the look. One size fits most adults. It retails for about $80 from Spirit Halloween. The traditional little green men don't have to be creepy. You can make or buy the perfect outfit. In fact, there are lots of ways to look adorable and out of this world. To make your own cute alien outfit, you'll need to pick up a few items at thrift stores and craft shops. Start with a lime green tutu or lime green T-shirt and a lime green stocking cap. You'll also need some 1-inch diameter black craft pom-poms, black felt, a few black pipe cleaners, some craft feathers in your choice of color, a needle and thread, an empty milk jug, and a hot glue gun. Place the stocking cap on the empty milk jug. This will hold it in the right shape as you glue on the alien decorations. Cut two teardrop shapes out of black felt. These will be the eyes of the alien, and they can be any size. Experiment with the placement of the eyes to decide what you like. Use hot glue to affix the eyes about an inch above the bottom of the stocking cap. The pointed ends of the teardrops should be facing out. Form a black pipe cleaner into a figure 8 by twisting the ends together to make a circle and then twisting the circle in the middle. Wrap one end of another pipe cleaner around the middle of the figure 8 so that it is securely attached and stands straight up when you place the figure 8 base on a surface. Wrap the standing up pipe cleaner around your finger to create a loose spring shape. Glue a black pom-pom to the end of the pipe cleaner to make an antenna. Repeat this process to create a second antenna. Apply glue to the bottom of each figure 8 antenna base. Press the bases onto the top of the stocking cap to give your alien a pair of antennae. Allow the hot glue to dry. For added security, secure each figure 8 with a few stitches. Cover the antennae bases with feathers, using hot glue to attach these as well. Allow everything to dry before removing the hat from the milk jug. Put on black pants and a lime green T-shirt or a black tank top and green tutu. Slip the alien hat on your head, and you're all set. Plush Alien Costume - This may be the cutest alien you'll see on planet Earth. The plush bubble tunic fits toddlers and small children and has a hood with antennae, pointy ears, and three big eyes. It comes in sizes 18 months through 6 years and retails for about $30 from Candy Apple Costumes. Alien Morphsuit for Kids - School-aged aliens will love this classic look from Party City. The Morphsuit is made of stretchy fabric that provides a seamless look, and the alien face is more cute than scary. It comes in sizes medium and large to fit kids up to five feet tall. This costume retails for about $40. Miss Martian Alien Costume - For a flirty take on the traditional green alien, try this offering from Party City. It features a furry alien hood with ears, antennae, and a single eye. A galaxy-printed, wired mini-dress, green gloves, and fuzzy green cuffs complete the look. It comes in sizes small and medium and retails for about $55. If you want to send everyone running in fear, try out a scary alien costume. You can make your own or purchase one that is sure to terrify. You can get really creative when it comes to scary aliens. Start with a great mask, such as the Alien Cyclops, which retails for just under $60 from Horror Dome. Alternatively, you can try your hand at alien makeup. A simple but creepy look involves white and black face paint, available at any costume store. This look is good for kids who don't want to sit for a long makeup session. Paint most of your face white. Use a brush with black face paint to create teardrop-shaped alien eyes. Fill in the shapes, working carefully around the eyes. Paint your lips black as well. Spray your hair with green hairspray and create short spikes all over your head to create an intimidating style. Add an antennae headband if desired. After you've selected your mask or decided on your makeup, pick up some basic clothing and a mop head to use to complete your costume. You'll also need gray fabric dye, green craft paint, and a hot glue gun. Purchase basic black pants and a black shirt. Purchase a stringed mop head and some gray fabric dye. Dye the mop head gray and allow it to dry. Cut the strings off the mop head. Twist and knot some together. Allow others to remain untangled. Use hot glue to attach the strings to the pants and shirt. Add a few stitches as necessary to help keep the strings on. Use green craft paint to add details to the costume. You can create a skeletal design or simply add dimension to your mop string "tentacles." Put on the mask or complete your makeup. Put on the outfit. Alien Mask and Hands - The grinning mouth and creepy long fingers of this mask and gloves set is truly terrifying. Pair it with a simple coverall to look like your escaped from a government research facility. The mask and gloves fit most adults and retail for about $15 on Amazon.com. Alien Creeper Costume - If you aren't worried about your budget and want the scariest costume money can buy, order this option from Horror Dome. It features a nightmare-inducing maks, latex suit, boots, gloves, and pants. It is made to fit you and retails for about $1,800. Fanged Alien Mask and Leather-Like Robe - These offerings from Nightmare Factory are really frightening. The mask features a creepy fanged mouth and long tongue, and the leather-like robe has a shiny finish. They fit most adults although you could use the mask with a different robe to create this costume for a child. The robe is $95, and the mask is about $50. 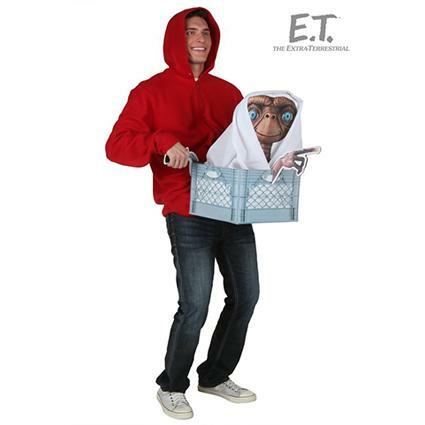 Some of the most recognizable alien costumes are those inspired by movies and television. Consider some of these options. The creatures from the Predator movies are among the scariest aliens out there. If you're feeling crafty and have a little time on your hands, you can make your own Predator costume. You can also buy a Predator costume from Oriental Trading. The outfit includes a mask, jumpsuit, hands, arm and leg guards, and belt. It fits most adults and retails for about $120. Another iconic extra-terrestrial is the Xenomorph from the Alien movie franchise. While making your own Xenomorph costume from scratch would take months and there are no complete versions of this complicated outfit for sale, you can create a great look from a few essential pieces. Start with a Deluxe Latex Alien Mask, which retails for about $50 at Rubies.com. Then use fabric paints to embellish a simple grey or black sweatsuit with the alien's body. Add a pair of creepy Alien hands, which retail for about $30 on Amazon.com. E.T. is another classic choice when it comes to movie-inspired aliens. There is a vintage McCall's sewing pattern you can use to create your own E.T. costume, but it is out of print. It's McCall's 8311, and you can find it on Etsy and eBay, usually for around $30. You can also purchase an E.T. and Elliot costume kit from Amazon.com. It includes E.T. 's face, a red sweatshirt, a blanket, and a paper E.T. finger. You add your own milk crate. This ensemble fits most adults and retails for about $60. Practice a funny or scary alien walk to give your outfit even more realism and charm. Whether you go for cute or creepy, the right attitude can really make your costume out of this world.